Monster Fest 13 is GO! The date for Monster Fest 13 is October 1, 2016. Mark your calendars and make plans to join us! We will start taking table reservation in the spring. Announcements will be made here and on facebook when the vendor application is live. Monster Fest is still on… full speed ahead! Monster Fest is still going ahead as planned. Latest reports show hurricane Joaquin is headed further east and will not hit us directly. If anything changes, we will post here and on the Monster Fest facebook page and the library will post something as well. So get inside, out of the rain, with your closest monster friends at Monster Fest! Monster Fest is only a week away! Are you ready? If you are planning to register for the costume contest, please be sure to arrive early. The contest starts at 3 pm, but registration ends at 2 pm. You MUST register before 2 pm to be eligible to participate in the contest. There will be a category for children (for children up to age 13) and an adult category for everyone 14 and up. You may register at the Costume Contest Registration table on Saturday between 10 am and 2 pm. We can’t wait to see what you guys come up with! See you at Monster Fest! Monster Fest is a free event. Wouldn’t you like to “pay it forward” for all the fun you are going to have for free? If that isn’t enough to make you donate… we could bribe you I suppose. If you donate to the Foodbank, we will give you a raffle ticket for a chance to win a basket full of awesome prizes! Past baskets have included tickets to haunted attractions, passes for other conventions, t-shirts, dvds, original art and jewelry, candy and more! Take a peak at this year’s basket when you make your donation at the giant Foodbank barrel. Be sure to check out the Vendor / Guest list page. A few cancellations and a few additions. The list will be updated as I get the information so check back frequently! What do you plan to wear for the horror costume contest? Any suggestions for what costume you want to see? Reply here and let us know! Please post a comment if anyone has any reviews or recommendations about local hotels that would be helpful for our out-of-town attendees! If you are looking for nearby lodging, I suggest checking out tripadvisor.com or another similar site. I have not stayed in any of the hotels personally, but people I trust from out-of-town have stayed at the Hyatt Place (#3 on the map) and spoke highly of it. 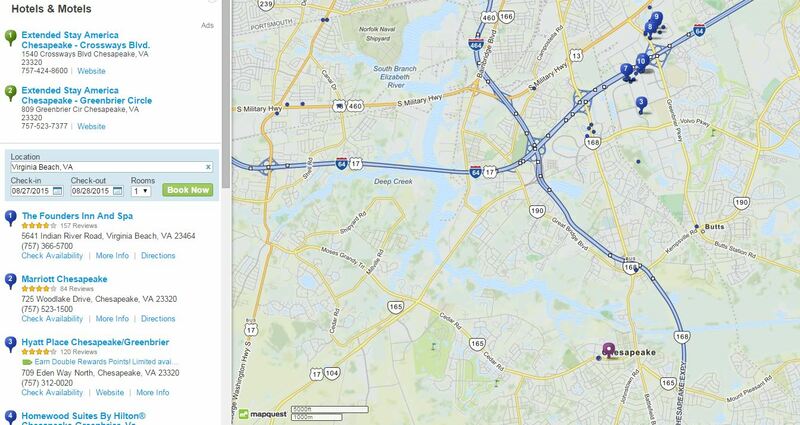 The purple pin is Monster Fest – Chesapeake Central Library @ 298 Cedar Road, Chesapeake, VA. The blue pins are the closest hotels. They are approximately 10 – 15 minutes from the library. Hope that helps. Looking forward to seeing you all there! Disclaimer: We are in no way endorsing or recommending any of the hotels listed. This is just to assist interested parties in locating the nearest lodging. Please feel free to share and spread the word about Monster Fest using the flyer link above. Be sure to check out the Vendor, Guest etc… page of our web site for a list of everyone you can meet and greet at Monster Fest on October 3, 2015. We’ve been doing this little thing called Monster Fest for going on 12 years now! Shocking how time slips by when you’re having fun. If you have attended Monster Fest in the past, what would you say is your favorite thing about it? Do you enjoy the panels? If so, any particular topic or presenter you would like to let us know about? Do you anticipate seeing a particular vendor again? Are you eagerly awaiting the movie line up for Fantasmo Cult Cinema Explosion? Just click the comment button and leave us a note. Looking forward to hearing from you!